Canola fields, Wagga Wagga, New South Wales, Australia. 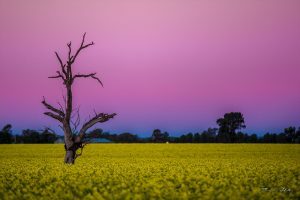 Yellow flowers of the canola against a pink and blue sky at sunset with a bare tree in the middle of the yellow canola crop. Photograph—framed or unframed limited edition signed print. Only 20 images available as limited edition and signed. Printed on archival Canson plantine fibre rag. Print size—20 x 16 inches. Framed image is 24 inches x 20 inches in total.